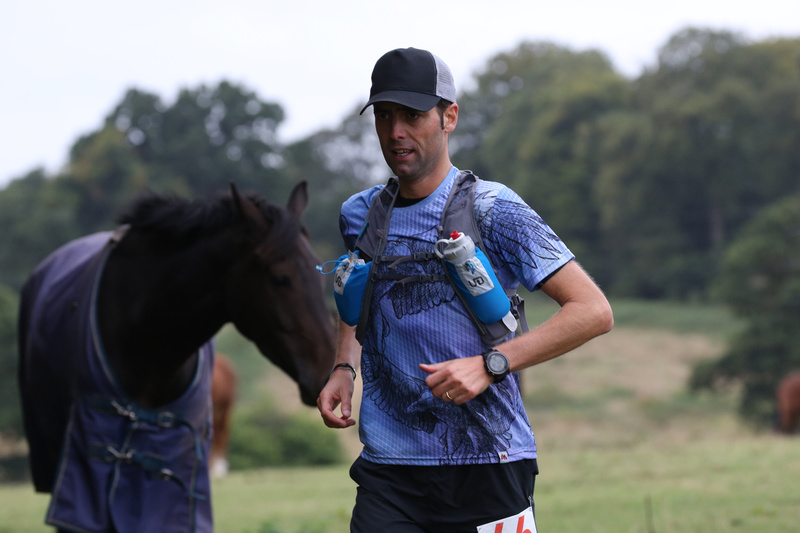 This is going to be a relatively short report as it comes so late after the event, but I wanted to say a couple of things about the my run on the North Downs Way 50 last May. Spoiler alert: it was my best 50 miler to date, for many reasons. But as usual let’s start by talking about the days leading to the event. After the performance on the SDW50 (I wrote about it here), I was really upset. I had trained very well for what I wanted to be my main race of the first half of year and I felt I was going to enjoy it and do well. The fever that caught me the days before the event ruined everything. 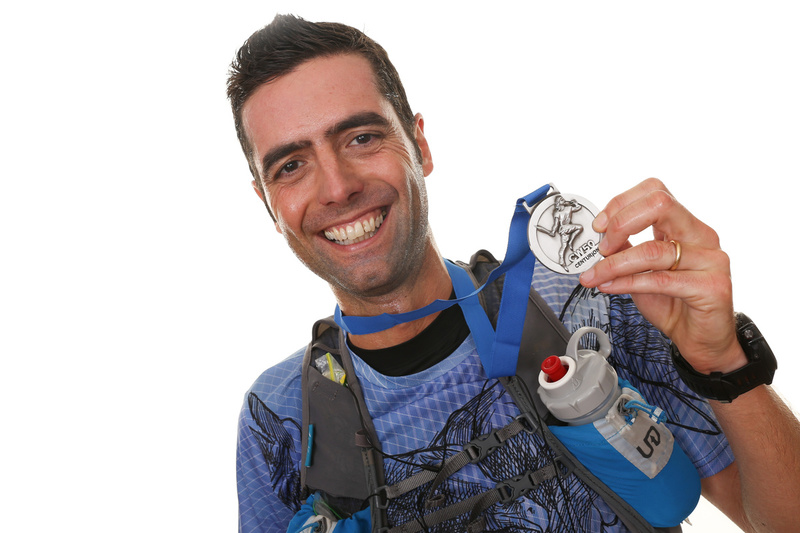 Luckily training is never wasted so I decided to just wait a month longer to check if my training plan worked: the NDW50 was going to be even more important. I had to keep the level of fitness. The week after the SDW50 I took it relatively easy, no speed training and just 60k in the whole week. It was Easter holidays so we went to Italy and I had a nice run with Davide on the Giro Dantesco, nice trails and no wild boars this time. During the Easter week-end I also went to reclaim the CR on Salita Bergeggi that was stolen from me for just a handful of seconds. It is mine again by more than a minute, so I should be ok until next year at least! Then I had two strong weeks of 105 and 110 km each with solid SSR sessions (like this one) during the week and longer runs during the week-end. Nothing super long, but both week-ends I went to the NDW, once with super tired legs and still managed a solid 25k run and the next week-end 32k on the NDW with two new friends and a dog. Then I had one 73k easy week to start the tapering and finally race week arrived: 10k a couple of times but the rest was doing nothing and sleeping as much as possible. I also had the excitement of changing job that week. On race day I woke up very early as usual and the classic pre-race routine of toilet – breakfast – toilet went perfectly well. I got the Race HQ early enough to find a nice parking spot outside the school at Farnham. I had enough time for a chat with various friends and then after the race briefing we walked to the start. Unfortunately some of us got delayed at the train crossing and by the time we decided to take the overpass we got to the start too late. The race had started at least a minute before we got there. Note to self: listen to the race briefing from the back of the room, near the exit, so you can leave as soon as it’s done and not get stuck. The first couple of kilometers were then a bit frantic as I did not want to be so behind everyone else, but then I made myself take it easy as the day was going to be long and I had enough time to make up for that lost minute. I settled on a nice easy pace. Some flat or downhill bit at just under 5 min/km, some slower bits around 6:30 if I was walking uphill. I basically walked everything that was making my heart go over 140 bmp. The plan was to be consistent all day, no crazy rush in the first half and no death march at the end. 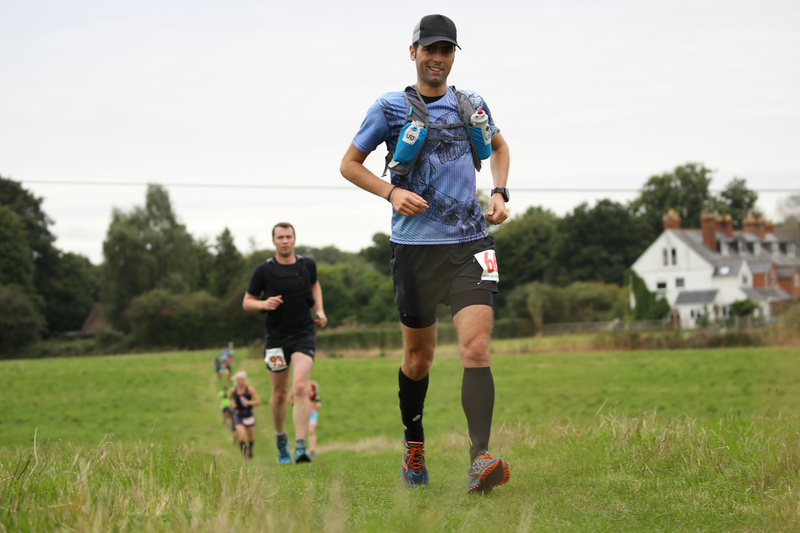 At the first aid station in Puttenham (at around 11k) I did not stop as I still had a full bottle of water and kept going at that sustainable pace. At around 20k we arrived at the St Martha hill which I had visited 2 weeks earlier. I remember in 2015 in my total ultra-ignorance I ran up all the way. This time I walked it easy and bombed down on the other side. So far so good. Very warm day but I was feeling great. A bit of up and down on big grassy hills and I reached the second aid station (23k) at Newlands Corner. I stopped very briefly for a bottle fill up and some water melon. This time I was not going to get anything else, no coke, no solid food. I had all my gels and Tailwind to drink, I wanted to avoid stomach issues this time. The next part of the trail is probably the one I ran the most in training. I find the flat woodland there a bit boring except the final part before Ranmore. I like the single track bits there, full of roots and speedy downhill. There was a very fast race going the other way round so we had to stops once in a while and let the other runners go by. From the 35th kilometer or so until Box Hill there is a lot of tarmac and a lot of downhill that usually kills my legs. I was not looking forward to that bit even if I enjoyed bombing down it in January’s race. Luckily I started chatting with another runner, very friendly Kevin, and the time went faster and even the under-pass before Box Hill was gone before realising it (I usually hate it). I was looking forward to Box Hill. Psychologically it feels like you are halfway through the race (even if it is around 40k out of 82k) and with the excuse of the long steps section I was looking forward to eating a bit more and take it easy. Instead it was the worst part of the whole race. I felt really dizzy going up, even walking easy I could not eat anything and felt so tired when I got to the top that I could hardly start running again. It took around 5k of slow running to feel better but by then my stomach was went a bit strange. This time I solved the issue straight away, I jumped behind a bush and the rest is history. I felt much better and got to one of the hardest climb (Reigate) feeling strong. Walked to the top and run the rest of the way to the 50k mark where the Reigate Hill aid station is. More water and watermelon and off I went. Apart from a couple of km on the road this is my favourite part of the race, especially the last wooden bit (Old Park Wood) before Caterham’s aid station at around 61k. It went relatively fast even if my pace was much much slower than the first half of the race. But I was running everything (except the hard climbs) and that is what made me very confident. At Caterham I had to sit down a bit at the aid station as again I was feeling super weak. I probably spent 2 minutes there longer than I wanted, but I felt I was at the limit, I could not push too much. This is where in 2015 everything went wrong and I suffered the rest of the race. This time I was not feeling super, but I was moving, always. The legs were in pain, but my head was in a good place. And I think this sums up the whole day pretty well. The body was in pain, but my mind was set to do well and made my legs go, just go all the time. And the more I realised I was going and going and the more I felt good. I started doing the math and while 8:30 hour (my dream scenario), was an impossible task I was happily going for around 9 hours which was much better than the 10 hours of 2015. After a bit I even realised that I could make it in under 9 hours and that was a pretty good boost too. The climb to the last aid station at Botley Hill (69k) was endless but the end was in sight. I had a quick cup of tea there, preparing for the last push. The final 13k were the most painful. I remembered from 2 years ago how hard the final fields were, but even if I was prepared it felt like they were going on forever. Finally after a million fields the finish line was in sight and for the last 2k I just gave it all I had. I even ran the last mile at around 4 min/km pace. I was so happy to see the end and even happier to have made it in 8:51, one hour and 9 minutes faster than two years ago. Training definitely had an impact, but I believe most of this PB performance is due to experience. Running your fifth 50 miler is definitely different than running your first. It had been a nice sunny day all day. I had a long time to wait for the bus back to the car so I quickly changed and then collapsed on the grass for hours. I probably drank 8 cups of tea and then had the mother of all hiccups, but I was the happiest man on the planet. As always the Centurion people and volunteers put together a wonderful day for us runners and everything was fantastically organised. Everyone at the aid stations and at the finish was so friendly and helpful. Thanks! I cannot wait to run the next one in September. Now I only need to survive my first 100k race! 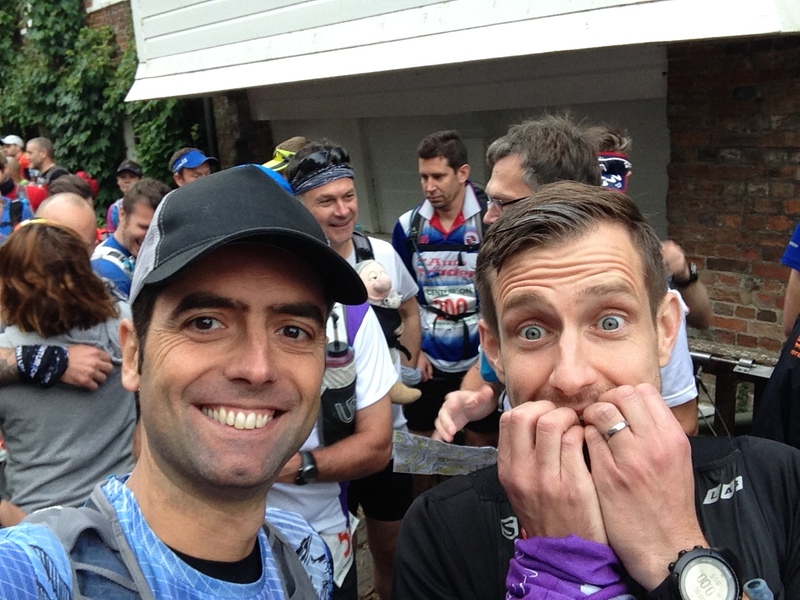 When I woke up for the final race of the year (Wendover Woods 50) I was pretty scared. The week before I was pretty confident and excited (as can be read from my previous post), but when at 4:15am I opened my eyes I started being worried. Darkness and coldness does not help to get pumped for a 50 mile race. I was scared of everything this time, not just the distance. I was afraid of the cold, the mud, the fact it was a five lap race, my stomach being funny for the last couple of weeks, my old injury coming back, the hills etc. While still in bed I had time to think about a million things that could go wrong. Luckily 30 minutes later, after having had breakfast, all the positive excitement came back and I felt ready, got into the car (after defrosting it) and left very early. By the time I arrived at the start it was still dark and all my fears came back. The start of the race was in a field with a couple of tents, pitch black. I left the car for kit check and registration and stepped on a cow poo straight away. By the time I had my bib, left my drop bag and got back to the car I was frozen and my feet wet (and smelly). I set the phone alarm clock to wake me up in 15 minutes and closed my eyes and tried to relax and get ready. When I opened my eyes (I did not actually sleep) daylight was coming but visibility was still bad due to the thick fog. Quick visit to the portable toilets and off we went. The start was not where the race ended, to avoid a bottleneck at the start due to a small stile. I managed to warm up a bit on the way to the start. The race briefing was the shortest ever and we were off. It was time to relax and put the training to the test. The Wendover Woods are quite nice. Small but nice. I had been there for one of the Rail To Trail marathons and I remembered steep hills and a lot of mud. Luckily this time the mud was not terrible, the trails were a lot better than I expected, soft, leafy, slippery in places, but never too muddy. The woods are quite small but the guys at Centurion managed to create a nice 10 mile loop that is very varied and fun. I only realised after the first lap that we were always running quite close to the centre of the woods, which made it fun as we kept on encountering the same people going for a stroll or walking the dogs. Most of them were nice and supportive of the race, asking us how we were doing and stuff. So one of my fears, the mud, was unfounded. My apprehension of steep hills, on the other hand, was not. This is the race with the most climbs I have ever done. I am sure it’s nothing compared to real mountain races, but for me it was quite a lot. I think more than twice as much as any other 50 mile race I have done. Usually the uphill bits are good to walk, eat some food and in a sort of way almost rest. Not this time. The hills were so steep that my heart rate while walking up hand on knees was a lot higher than while running on flat. After the first lap I realised my objective to finish in 10 hours was a bit too optimistic. I did the first lap in 1 hour and forty something minutes and I knew I was going to have to slow down if I wanted to finish. During the second lap, knowing the terrain, I started planning how I was going to survive running the same spots 4 more times. The first part was the easiest, almost flat, but I found it the least fun to run and I could not wait to get to the first big downhill, down what seemed like a dry river bed. Very steep and slippery with some hidden traps under the fallen leaves. Then after a small climb where I usually had a gel, there was an even steeper descent (called Powerline) that ended in a field, the only bit not in the woods. Then a steady but easy climb and a bit of up and down took us close to the fist aid station, but we could not stop, we could only see it 10 meters away. There were some more kms around the woods before we got there again. One of the climbs soon after was not even on a visible trail and even after 5 laps I did not know what the best way to tackle it was. The first time I went zig zag, the other times I just went straight towards the next tree with a course sign. No idea what was best. More downhill and then a nice very runnable dirt road finally took us to the aid station. There was only one in the whole race, apart from the one at the start line. So getting at the aid station was quite a morale boost as it meant more than half of the lap had been done. I only ate fruit and got hot tea (in the last two laps) from the aid stations, the rest was all about trying to eat my own gels and drink my Tailwind powered water. The long easy climb after the aid station that I ran the first time around became my favourite place where to eat and relax walking for the other 4 laps. The rest of the lap was first made of a larger bit of dirt road that was very runnable (Boulevard of Broken Dreams), most of it downhill, then a long climb that took us to a nice single track trail (Hill Fort Loop). The craziest climb was at the end of the lap. It was so steep I had to stop and catch my breath just to walk it, grabbing trees and branches to help me stop from sliding down. More up and down and then a final climb to the finish line. After the first lap I was already dead. The second lap I barely survived. The third lap I was struggling to eat. I looked forward to finish the third lap as I had decided to grab my drop bag and change my top, get the headlamp (a must have after 1pm) and get my MP3 player. I felt like a new person, but only for 5 minutes, then I felt s**t. I suffered from not having eaten enough the lap before and the 4th lap became very painful. I was seeing blurred trees and I struggled a lot. I was in the top 30 by the end of lap 3 but I was losing places in the first half of lap 4. When I got to the open field I felt like I was not going to be able to run anymore. I made myself eat more. I had one gel, one salt stick, one Cliff Shot and 3 almonds all in one go. Drank half a bottle of water and Tailwind and walked for 3 minutes to let it all go down. I slowly got better and got into gear again. By the time I was approaching the crazy final climb I was running super excited. I knew the trail by heart then. Seeing certain rocks or trees that I knew were going to be there gave me strength. I also got to a point where running downhill was so painful I managed not to think about it. I went in a sort of trance where I was thinking of myself as only being made of two arms, with no legs. I let my feet go by themselves and did not think about them, floated. It worked quite well and I finished lap 4 on a high. One more lap to go! One final cup of tea (I never stop at aid stations, I eat and drink walking away from them even if it means carrying a paper tea cup folded in my pockets) and I was ready for the final push. After twenty minutes in the final lap I had to turn on the head torch as it was very dark and everything changed. The woods became even more magical. My MP3 player was playing the right music (instead of the boring podcast I had on lap 4, big mistake) and I tried to enter that special “made only of 2 arms and no legs” trance. And it worked. I felt like I was going fast (later I discovered it was the slowest lap I ran, but it felt much faster than the 4th) and started overtaking people again that I knew where on my same lap. Running down the river bed I was almost in tears of happiness, I could not believe I could still run and I was so happy of being in the woods in the dark. When I got to the descent before the field I slipped and fell for the first time and I thought it was about time! I was too excited to be at the end to care. The fourth lap was painful in places, especially the downhills, but otherwise it was the most fun, magical and emotional of the day. I loved it. Almost at the end, in the middle of what seemed like nowhere, in the dark, a family with kids were there with cow bells encouraging me, I was so dead that it felt surreal and I could not stop thanking them while I running away. I got to the end so excited I even sprinted the last one hundred meters. I could not believe it, the day was over. It felt eternal but at the same time short. I finished in 10 hours and 27 minutes. 30th place (which I am very happy with). I collapsed in the car and sent messages to everyone to let them know I was alive. I changed as quickly as I could into warm and dry clothes and went back to the starting tent aid station for a very well deserved minestrone which tasted like the best thing I had ever eaten. I cannot thank the Centurion people and volunteers enough. It had been a fantastic day and I cannot wait to finally try and do all four of the 50 milers next year. I have plans. Stay tuned!